(This from 3 years ago) Implosion Group friends: Please contact WIKIPEDIA - and note their error: (they removed our correction) In their DEFINITION OF GRAVITY - we replaced the embarassing - ignorance of their sentence:"While a great deal is known about the properties of gravity, the ultimate cause of the gravitational force remains an open question." Jonathan Dickau writes... (April 28,08) Hello Dan, I wanted you to know that I haven't been idle. You should be pleased to find that there is now an article on the Wikipedia (English) for Fractal cosmology, and that it mentions the work of El Naschie prominently. I haven't put up a link to your pages yet, in part because there are so many that pertain to this subject, and I want to find the best one (/completefractalcosmology perhaps) to include. Perhaps you can create a new page with minimal content, that has all the links to your other pages on the topic.... I am trying to avoid censure, as the predecessor to the page I've created on the Wiki was summarily deleted by the editors. So far; I've toed the line, by keeping my treatment of the subject close to the accepted views of the scientific community, to maintain that all-important neutral point of view. I have not elected to even include a link to my own pages. I intend to make my case stronger first, by writing some papers to show the underpinnings of my work more clearly. But I'm on the path of making that real in a serious way. I'll be presenting my Mandelbrot Set Cosmology theory at the 2nd Crisis in Cosmology Conference, in Port Angeles, Washington, later this year (Sept 7-11). And I've got a book in preparation, with strong publisher interest. So; you can expect more news from me, on this subject. All the best, Jonathan "
As Andrei Linde writes... ref- http://jond4u.jonathandickau.com/cosmgrav.htm : "... Physicist Andrei Linde, and others, have found fractals helpful in modeling the behavior of the early universe. Their work suggests that the fractal nature of space may actually be the cause of gravity. More recently; the work of Alain Connes has shown that noncommutative spaces evolve fractality naturally. The Mandelbrot Set is the most complex fractal object which can be represented in two dimensions. In my opinion, the Mandelbrot set and its derivative forms (including the Fractal Butterfly) have a lot to convey, which aids our understanding the nature of space, and will help solve the riddle of gravity. Recent observations of the large-scale distribution of matter in space show it to have a fractal pattern. " The Hall of the Hungarian Cultural Foundation , 1014 Budapest, I. Szentháromság tér 6 - http://www.metaelmelet.hu./egyelm/program_en.html. May 2008 (friday) at 13.00 opening speeches and key note lectures from the world renowned guest scientists. Fred Alan Wolf  USA: Is the Mind of God Found in Quantum Field Theory? Visualizing WHY Self-Similarity of Charge symmetry- is the electrical cause of the gravity (constructive charge collapse) which holds atoms (and everything) together..
At the previous- Unified Field Physicists Conference - in Budapest- ( goldenmean.info/fractalvacuum) Nassim Haramein- ( theresonanceproject.org ) beautifully aligned with the principle - lecturing that the Nature of the Universal VACUUM was FRACTAL... but then - he demonstrated how he missed the point - when he went on to INSIST the symmetry of that vacuum is TETRAhedral. When in fact the only symmetry of charge in the vacuum that can create gravity is DODECA - because only that creates Golden Ratio and thereby allows the key principle of gravity - perfect fractal wave compression / collapse (the dodec/icos dual is very much a required SUPERset of the tetra/cubic lattice - as Michael Heleus nicely points out- by just penta spinning tetra/cubic lattices- they create Phi and implosion - likely the essence of E8 Unified Field.) . Over one million people have read our proof of his error - goldenmean.info/caughtinthematrix - complete with interactive software download - to prove only Golden Ratio allows interference to be constructive (and thus compress in a fractal). In this way Nassim's tetra matrix is in fact the OPPOSITE of compressibility / and fractality! I tried to explain this to him in person. In the tetra cube all wave interactions are octave based producing maximum DESTRUCTIVE interference - by actual experiment- thus in fact PREVENTING compression and fractality. At that time - it seemed Nassim missed the Golden Ratio principle behind the fractal compression that became the solution to gravity. He declined our invite to present in Budapest this year . El Naschie accepted the invitation I arranged for him - and will present the Golden Quantum mathematics evidence that FRACTALITY is the CAUSE OF GRAVITY - which is the TITLE of my original presentation last year (Fractal Electric Cause of Gravity was my term).. . At that time - we did not have the mathematics model confirmation with El Naschie. More good news- having just returned from UK wildheartgathering.com - we co-presented with David Ash - author of PHYSICS OF CONSCIOUSNESS - proposed for the Templeton prize- who now agrees and in collaboration -is changing the title of his next book to FRACTALITY....! Interesting to note that the previous week - we copresented from Venice to Greece - (filmed, along with 42 international experts) with - Dr Manjir Laughton - author of PUNK SCIENCE ( Physics of Soul) - While her main point seemed to be that EVERYTHING is a BLACK HOLE (seems similar to vortex or string theory) - we suggested to her the real breakthru may be to describe the symmetry (obviously fractality) which CAUSES black holes ! (like those measureably made by DNA the REAL physics of soul?) Dr. Manjir- replied here - appropriately noting that in her book she DOES say "that the universe is fractal and quotes the group of Italian physicists saying so." So perhaps for her - the next step is near- agreeing that Fractality is the CAUSE of gravity. 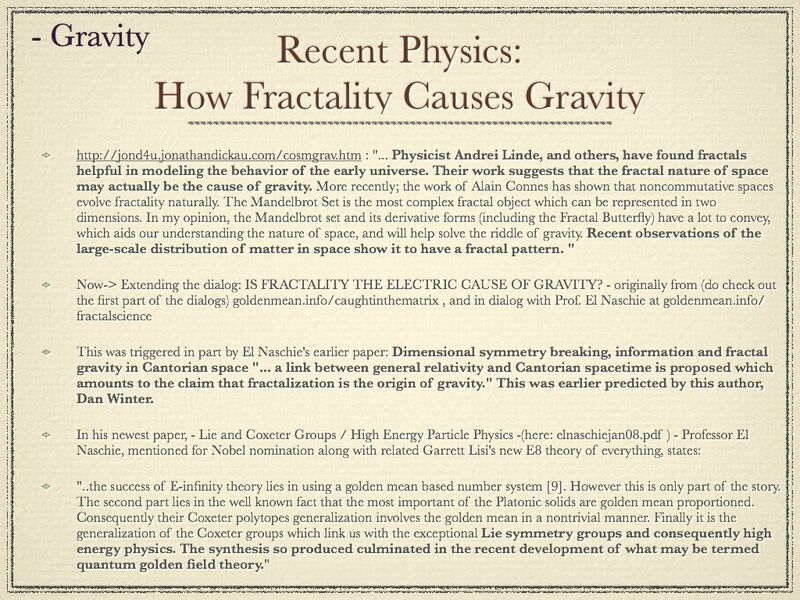 Physics after Einstein is clear- that perfect wave collapse is the holy grail of field unification - now with Prof El Naschie's "quantum Golden Field Theory" mathematics - announcing fractality causes gravity... It is irrefuteable that Golden Ratio PHASE CONJUGATION is ONLY mechanism of this perfect wave collapse. Allowing waves to add AND multiply recursively (Golden Ratio's exclusive) - IS the perfect wave collapse & holy grail of physics! 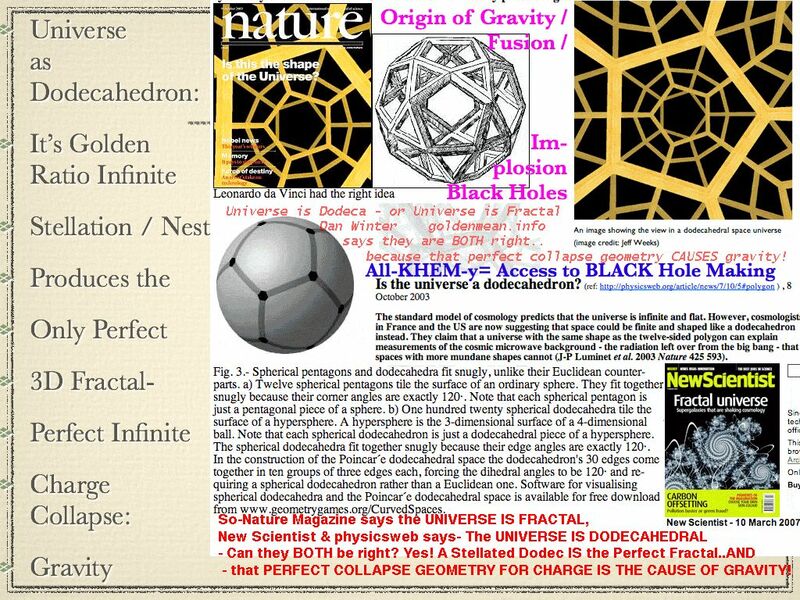 AND - the prepared lecture - for Budapest Conference of Physics and Unified Field Theories- (see below) this year with Fred Wolf, Prof. El Naschie, John Hagelin..
We must clarify the profound - path out of chaos which is Fractal Field Phase Conjugation. This will then allow us to better introduce Earth's gravitationally confused scientists to the gravity / black hole making physics WHICH IS- the most powerful thing ABOUT DNA. It was helpful - when Peter Gariaev (he is with us again at Budapest- see list below) - after measuring DNA making these BLACK HOLES - he explains the reason DNA is able to do this is OPTICAL PHASE CONJUGATION. ( goldenmean.info/dnawave ). The point being - then to learn the (fractal and phase conjugate) field theory of BLISS hygiene - to ignite DNA to this - it's only sustainable state ( goldenmean.info/dnamanifesto ). Frank - originally interpreted his set of angles predicting color wavelengths- as the angles of a tetrahedron IN a dodeca. I noticed that in his beautiful plot - the ONLY angles (63 and 117 degrees -P2 + P3) which were not cubic (45/90/135 degrees, 4 wave mixing in the optics of phase conjugation) were SIMPLY THE INTERNAL and EXTERNAL FACE ANGLES OF A DODECAHEDRON. And since I was the first to publish that the dodeca stellation ( & icosa interdigitation) produce - infinite nodes ALL of which x,y,z vertex values being simply mulitples of Golden RATIO - I then framed the original hypothesis this was evidence that PHASE CONJUGATION (literally the ability of phase angles to conjugate constructively) was the cause of COLOR. See above graphic - PHASE CONJUGATION at the center of GOLDEN QUANTUM FIELD producing DODECAHEDRON- produces an increasingly broad band PLASMA IMPLOSION at the center, which THEN "SELF ORGANIZES" SORTS AND ELIMINATES EVERY SPECTRAL WAVE NOT IN PHASE - (in addition to being the origin of gravity, and perception and life and consciousness) - is the CAUSE OF COLOR. 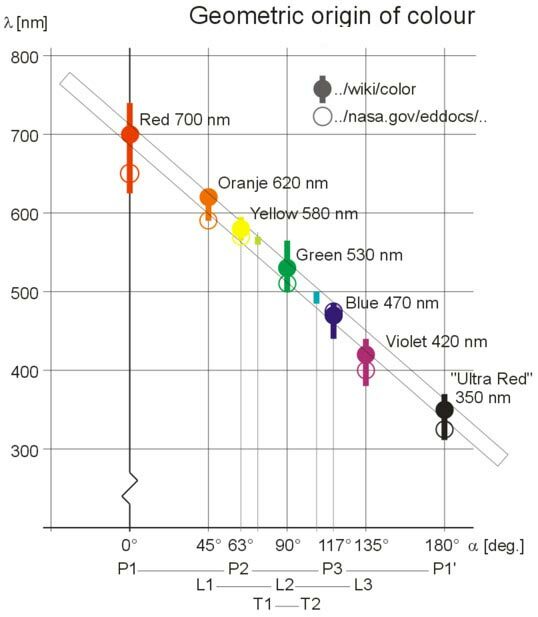 THE CAUSE OF COLOR: The broad spectral bandwidth implosive plasma fusion at the center of PHASE CONJUGATION -("this is the way phase conjugation.." - pic above) thus sorts and eliminates all toroid photons that do not fit the dodeca --phase conjugating face angles - and thus produces the 3 dimensional photon phase or tilt discipline called COLOR. (next pic) 2 dimensional models of the physics of color simply are not complete. This (perfecting of wave collapse) ALSO then determines which wave has 'permission' to be distributed - become radiant - (fractality is COHERENCE perfected) : thus defining for example pure intention, the collective unconscious, and how memories survive death electrically - out of DNA's phase conjugation ( goldenmean.info/dnamanifesto ) - See the story of how karma and forgiveness are directly the result and mechanism of constructive collapse and phase conjugation in DNA: goldenmean.info/purification . More notes on Color: Dan's perspective: RE: new symmetry model of ORIGIN OF COLOR - below - based on DODEC - Dan suggests that the most likely reason the primary colors frequencies (P1=R, P2=Y, P3=B) differential angles are accurately predicted by the dodecahedron planes central angles is because PHASE CONJUGATION is specifically permitted BY THE GOLDEN RATIO stellations of this dodecahedron. He hypothesizes that the REASON the photon toroidal vortex HAVE to find dodeca symmetries -and thus create COLOR- is because that dodeca array is the only way PHASE CONJUGATION and therefore 3D sorting / successful compression + distribution can happen. Dan's picture shows how those conic dodec angles also have a planar hex view... like the 3 primary colors/ color pairs. (Dan see's these conic angles as the result of the sorting process - which Frank has modeled. Frank suggested the angles he found were those of a tetra nested in a dodeca, Dan finds more directly the 63/117 degree angles are simply the FACE angles of the Dodeca). Note that in the stellated DODECA /ICOSA infinite 3D nest / fractal (SarMother Kit)- ALL of the vertex have x,y,z rectilinear coordinate values which are simply MULTIPLES of GOLDEN RATIO. THAT means the 6 cube cones (4 or six wave MIXING from optics) above ACTUALLY make all the NODES of the stellated DODECA! Dan explains the vortex into the dodecahedron's planes are NOT actually at 60 degree angles in 3D - but there is a 2D view of them which is HEX- like the shadow of the cube in the dodec- and has 60 degree shadow view of those cones. Dan believes this is a useful understanding of how 3 pairs of primary colors are sorted by phase conjugation. (the hues above are not precise). The vortex into the toroidal photon needs to be dodeca because phase conjugation is how waves sort. Dan suggests this also explains alphabet origins: The alphabet's symmetry of the vortex index- is a result of the need to phase conjugate- in order to compress and sort and be distributed successfully. Only that which can phase conjugate can be distributed.. (BE SYMBOLIZED is to BE EMBEDDED) . All the primary and secondary colors are lined up with the dodeca- planes -(parallel and perpedicular).- because getting lined up-( or perpendicular) with the faces of the dodec is how the light rays acheive the necessary phase conjugation. (Stellating the dodec is natures only 3D way of nesting by Golden Ratio, and Golden Ratio is the only perfect way to phase conjugate - that is - to add AND multiply constructively). Dan is hypothesizing there is some important parallel to phase conjugation as in a phase conjugate mirror optically; he believes Golden Ratio based phase conjugation IS the primary mechanism by which color is sorted by frequency. Also Dan believes that this sorting principle for color DOES occur outside of, as well as inside the human perception. (Frank apparently is suggesting the phenomenon of color only exists inside human perception). Dan suggests this dodeca phase sorting for colors inertial symmetry is also how nature - selectively employs the photon's inertia calibrated in this way - for example in photosynthesis. (where GREEN at 90 tilt of the photon is the ONLY angle at which the photons inertia is neither centripedal or centripfugal-enabling biologic moleculars to balance it optically on the photosynthetic chemical - head of a pin - while for the opposing RED - the centripedal side of the photon - the very word ADOM - means to MAKE HARD - in Hebrew). Human perception (of color) had to utilize a perception of this phase conjugation phase sorting in order to embed and survive in nature. Dan also believes that the sorting for wavelength which is also a sorting for color bands inside a prism is a 3 dimensional toroidal vortex photon phenomenon.THE SORTING (color) IS THE RESULT OF PLASMA IMPLOSION IN CENTER DUE TO PHASE CONJUGATION. Dan does not believe the sorting by wavelength in a prism can be well described as simply 2D waves. (which is the unsatisfying current physics explanation of color). Now we are announcing the ability to completely reinvent how to heal, and create beauty (color fusion by phase conjugation - the essence of 'fashion') - knowing the corrected physics of color.